The following video shows the submarine is hovering very close to water surface, sometime it reaches water surface, or floats. To set submarine floating on the water surface is fairly easy, making it sink is the easiest. But it is not easy to make the submarine hovering in the water. With this science toy, we can set it to hover in the water. Read also baking powder submarine which can move like a real submarine although it is made only by origami of paper sheet and polystyrene and powered by baking powder. This science toy submarine is driven by an electric DC motor and powered by 1x (one) AAA size battery. Submarine body is made of drinking straw, polystyrene, rubber bands, and colored plastic sheet. 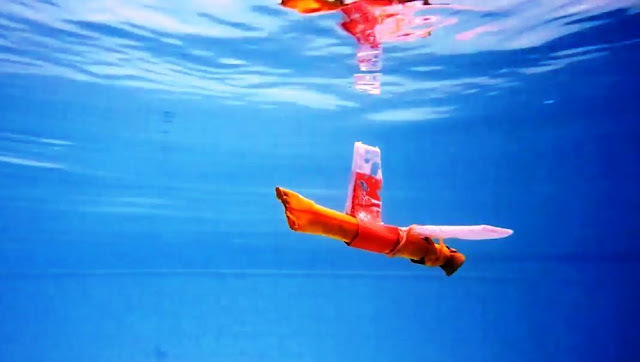 Although it is made of household material, with a certain design this submarine educational toy can be set to float, hover in water, or dive to the bottom of swimming pool. The setting is done with no replacement of any component. This submarine can achieve speed 56 centimeter per second or about 1.8 foot per second. Both of the following videos are featuring the submarine hovers in the water, about 20-50 cm below the water surface. The video below shows the submarine set to dive to the bottom of swimming pool.